I'm going to say it again. 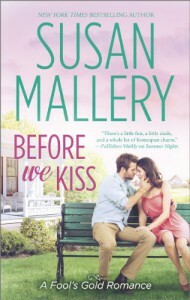 There is a REASON Susan Mallery is one of my FAVORITE Authors!! From disastrous relationships in his past to her having raised her sisters there are obstacles in Sam and Delina's relationship. The one night stand they had months prior, when Sam awoke to a room full of wedding gowns and a "How to get him to propose." list on the wall scared him stupid and he ran away in the night. It takes a huge weekend business party to get them together again! The chemistry between these too is sweet to watch develop! Can't wait for Jack and Larissa's story next!